Maybe it’s ups and downs that feel like they come out nowhere: suddenly you’re happy for no reason, and then half an hour later you’re irritable and snapping at everyone and you’re not quite sure how you got there. Or maybe you can find a “reason” but it’s such a tiny thing that it just doesn’t seem normal to be so affected by it: who suddenly plunges into a horrible mood because the grocery store was out of your favorite tomatoes? Mood swings, or wildly unstable moods, have all kinds of causes. Hormones are the most famous (see: menopause, pregnancy, PMS). But actually, diet might also be a factor. Blood sugar control, gut health, and diet-related stress can all affect mood stability – here’s a look. (If you want food and mental health in general, go here). Let’s start with that great emotional regulator: sugar. Plenty of people use sugar to regulate their own moods (self-medicating with chocolate when they’re down), and the really dangerous thing about that is that it (temporarily) works. We’ve covered that here. But even if you’re not trying to use sugar as a mood enhancer, levels of blood sugar and blood sugar control still have a giant effect on your mood. Most people aren’t diabetics, and most people rarely get to diabetic-level blood sugar lows (although if you artificially induce diabetes-type blood sugar fluctuations in non-diabetic people, you get the same mood problems). But blood sugar isn’t a switch that you flip from “healthy” to “diabetes.” It’s a spectrum from good blood sugar control at one end to diabetes on the other, with problems steadily increasing the closer you get to the diabetes end. The review found that diabetes-level hypoglycemia was unlikely to be a huge driver of changes in mood in healthy people. Most people – even most people on a typical American diet – just aren’t quite that bad at regulating their blood sugar. But the review also cited a bunch of studies on aggression and violent crime suggesting that even “moderate” blood sugar swings were enough to impair emotional regulation. Poor blood sugar control can make you more vulnerable to mood swings even if your absolute blood sugar levels rarely cross “normal” limits in either direction. Resources for managing blood sugar levels: Paleo is a good place to start, and here’s more information. You switched to Paleo. You’re off the blood sugar rollercoaster. So why are the mood swings still coming? Or even worse, why did the mood swings suddenly start? Here’s a look at two diet-related problems: gut health and diet-related stress. Yep, it’s the gut again. We already knew that the gut and the brain are a two-way street when it comes to mood disorders like depression and anxiety: gut health can affect brain health, but mental health can turn right back around and affect gut health. Here’s a whole article on that, but that article is really about stable patterns of unhappiness or anxiety – important problems, but not the same as mood swings. 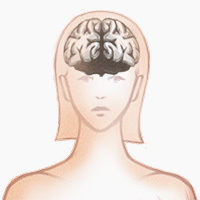 The two-way brain-gut relationship also holds true for mood swings. This study found that problems with wildly fluctuating mood were associated with gastrointestinal symptoms. Specifically, mood swings were linked to functional gastrointestinal disorders, problems where you have symptoms but no obvious physical cause. Constipation, diarrhea, and Irritable Bowel Syndrome are all functional gastrointestinal disorders. Gut problems are also associated with mood swings even in patients with physical abnormalities. This study found that patients with Crohn’s Disease had an unusually high rate of mood swings. Patients who had surgery had fewer mood swings, which is exactly what you’d expect if treating the underlying gut problem helped treat the brain-related symptoms. There are all kinds of reasons why gut problems can cause psychological symptoms. The gut produces most of your body’s serotonin, an important neurotransmitter regulating mood. Gut flora changes may also have really important effects on mood and mental health (here’s a free full-text overview). If you’re struggling with mood swings and also with gut issues from garden-variety constipation all the way up to Crohn’s Disease or other serious problems, the two could very well be connected. It’s also worth noting that not all gut problems actually have obvious gut-related symptoms. Celiac Disease is notorious for this: sometimes the first symptoms are skin rashes, or psychological problems, not diarrhea and abdominal pain. Mood swings might be caused or worsened by an underlying gut problem (whether or not you have gut symptoms). Resources: Start here for adapting Paleo to help figure out what’s wrong and heal your gut. Stress: Yes, it’s a Diet Issue. Another reason why gut problems might contribute to mood swings is much more basic than anything about serotonin or the gut flora: they’re stressful. Stress basically wrecks people’s ability to regulate emotions. Little things seem big. Stress reduces cognitive flexibility and the ability to “switch gears” or distract yourself from a bad mood. The more stress you’re under, the more vulnerable you are to mood swings, and the harder it is to “snap out of them.” Getting enough sleep and moderate exercise, both of which relieve stress, reduce mood swings. 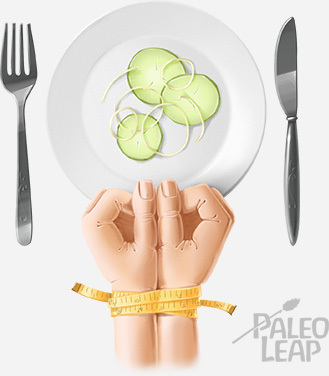 Extreme calorie restriction is a stressor. Don’t do that to your mind or your body. Social worry. If Paleo affects your social life (e.g. you “can’t go out to eat anymore”), that can be a huge stressor. Social connections improve emotional stability; anything that breaks them down will make you more vulnerable to mood swings. That can totally tank your brain’s ability to keep an even keel, and make you much more vulnerable to mood swings. Resources for managing Paleo-related stress, and reducing your total stress burden to make yourself less vulnerable to mood swings: the Paleo meal template (for eating-enough-food purposes), days off from the gym, and some tips for making shopping and cooking easier and less stressful. Before wrapping up, two myths that deserve a swift debunking. The myth goes like this: when you eat carbohydrates, it makes an amino acid called tryptophan more available, which allows your brain to produce more serotonin. Serotonin is a feel-good chemical, so eating carbs makes you feel better. But even a tiny percentage (less than 5%) of protein in the food will completely prevent this effect. That would rule out most candy bars (Kit Kat = 7% protein, Snickers = 7.5% protein, Twix = 7% protein, Hershey’s Special Dark = 6% protein). The only way to make this happen would be to (a) fast for a long time, so you don’t have any protein left in your digestive system, and (b) then eat literally pure sugar (e.g. a can of Coke) and nothing else. It just isn’t common and probably isn’t happening to you. Not in any amount large enough to actually have a noticeable effect. There’s a lot of research on chocolate and cravings, but it probably has more to do with the sugar in most chocolate products than anything inherent to the chocolate. The Bottom Line: Nutritional Advice for Managing Mood Swings. Manage dietary stress. Eat enough food (extreme calorie restriction is a stressor! ), sleep, work on ways to fit Paleo into your life without a lot of extra stress about diet. Manage your blood sugar. Here’s that post on blood sugar basics again. Heal any gut problems. Here’s where to start. Eat fish. Fish provides zinc and Omega-3 fats, and this study suggests that both might be protective against mood swings. (And the Omega-3s increase absorption of zinc, so eating them both as a package deal is helpful). …and remember that there’s more to it than diet. Mood swings can be caused by all kinds of things, and diet can only address some of the underlying causes. If it’s not helping, the answer might be somewhere else.